If you’re fascinated by history, religion, or both, then you’ve got to check out this church on a college campus in northern Kentucky. In 1922, Ripley’s Believe It Or Not dubbed it “the Smallest Church in the World.” It looks like something you would find in the hills of Scotland, not Kentucky, which makes it all the more captivating. Continue reading to find out more about Monte Casino Chapel. Monte Casino Chapel is located on the campus of Thomas More College in Crestview Hills, Kentucky, not far from Cincinnati. You can find it sitting next to a small lake off of Turkey Foot Road. The chapel measures six feet by nine feet, and the ceiling is eight feet high. It was built in 1878 by monks at a monastery in nearby Covington. The monks who built the church operated vineyards, and they used to visit the church for prayer after a long day of work. When prohibition hit in 1920, the monks were no longer able to distribute their wine to other states. With no way to support themselves, they had no choice but to leave Kentucky and return to Pennsylvania. 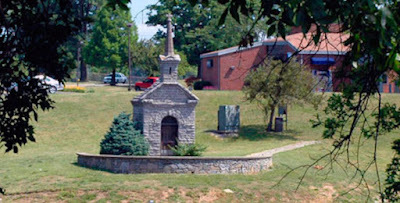 Monte Casino Chapel was abandoned for the next 45 years in its original Covington location. A local historian named Chester F. Geaslen took an interest in the chapel, and attempted to find its original owners since it had fallen into disrepair. In 1964, he found that the rightful owner was a plumber named Fred Riedinger, who had bought the land that the chapel occupied from St. Vincent Abbey in Pennsylvania. Riedinger decided to preserve the chapel in memory of his mother. Monte Casino Chapel was moved from its original spot in 1965, which was developed into a residential neighborhood. It now looks out over this lake at Thomas More College. The move from Covington to Crestview Hills was still a challenge, even though the trip was only six miles. As the chapel rode in a flatbed truck, someone had to ride on top of the truck to manually lift up utility lines so the chapel didn't hit them. The structure also weighed 50 tons, which added to the eight hour trip. You can go onto the Kenton Co. Library Site, Faces and Places, and view the moving of the church. Houses were already built at the time.